The Old School Lives Again. Once again Grade 3/4 teacher Elvira Paternoster invited Live History to bring the Old School to her lovely students at New Town Primary School. The school is fortunate enough to be able to walk up to the old Sunday School building at the Orphan School complex, to use as their 19th century classroom. Students dressed in the costume of the time and arrived fresh from “collecting eggs and milking cows” carrying buckets and baskets. They were quiet as mice as the day opened with the Lord’s Prayer and God Save our Gracious Queen. Times tables were recited and copy book work was done. Afterwards Mrs Hughes was presented with an apple for the teacher and a bouquet of flowers. Thank you New Town Primary! 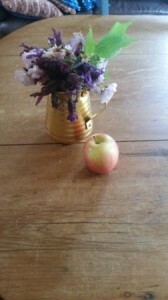 An Apple for the Teacher and Flowers.